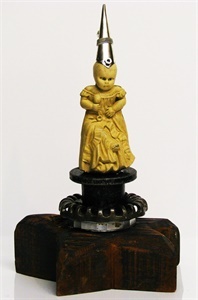 This Kachina has grown a metal core to rise like a phoenix, into the new millenium. Time has never been this colorful. 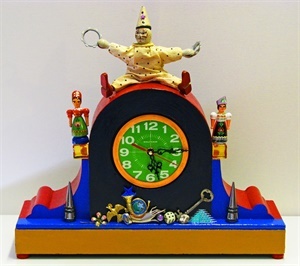 This working clock assemblage features an original vintage Schoenhut clown atop a painted vintage clock case with bright green face, old swiss wooden figures and interesting bits in the foreground. Tells perfect time! 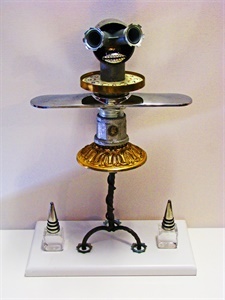 Spacey new millenium Kachina is created from plumbing components, clock, lamp and door parts, and more - it's ready to take off. 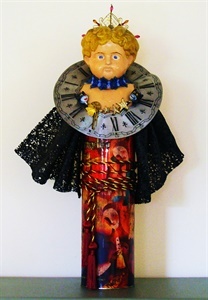 A Re-Psych!-Le Assemblage created from vintage tin doll head, old metal container, clock component and other vintage bits and bobs. 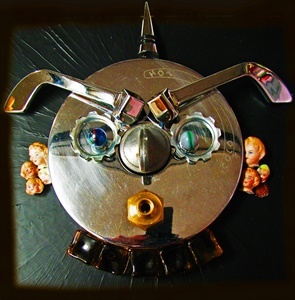 This young princeling assemblage was created using an old doll head and vintage items - metal container, broach, UK ceramic goblets, and more. 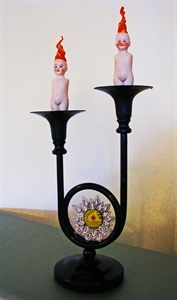 Mystical assemblage created with antique early 19th C baby rattle, plumbing parts, broach and more. 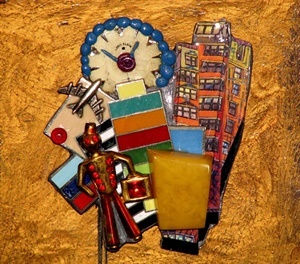 Whimsical assemblage highlights vintage bisque figures dug up from old porcelain factory in Thuringen, Germany, enhanced with polymer clay "flames", vintage tin ad button, mid-century broach. all displayed on an old candleholder. 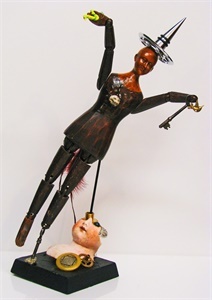 Based on Native Indian story teller figures, this assemblage is crafted from old plumbing components, bisque heads dug from old porcelain factory in Thuringen, Germany and more. Otherworldly creature is made with German factory dig finds, vintage wooden carved figure, antique French gaming chip and more. 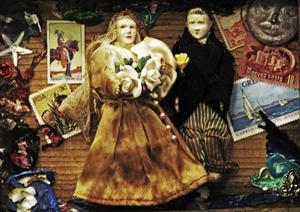 This assemblage is a marriage of 1950s miniature figures, and vintage components - old earring, mini tarot cards, stars, stamps, beads, etc.- in a vintage green frame. 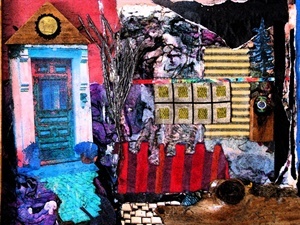 This collaged assemblage of old fabrics, coin, pieces of trees and more harks back to the feeling you get when you approach home after a long absence. 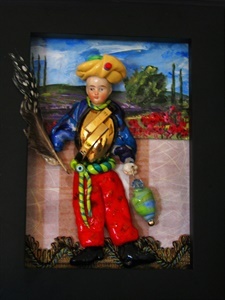 Here's an assemblage created using a broken vintage pottery head dug from an old German figurine factory in Thuringen. 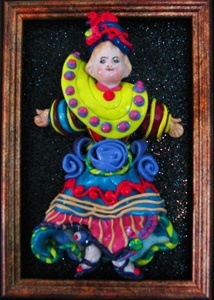 Her body is built from polymer clay, old earring and more, with a black glitter backdrop and frame. Fine art assemblage is made from a broken porcelain head found in vintage figurine factory in Thuringen, Germany, also old earrings, polymer clay, painted backdrop, feather and more, framed in black. 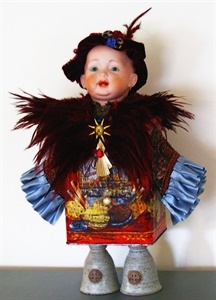 Assemblage of vintage porcelain head dug from old factory in Thuringen, Germany, fabric, polymer clay, stars, vintage jewelry and more has a whimsical, magical quality. 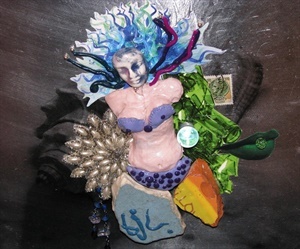 Collaged 3D assemblage was created from polymer clay, pottery schards, 1930s applique, marble, vintage stamp and more, on a silvered wood base. Whimsical assemblage of vintage metal broach, charm clock face and more on an acrylic backdrop is raised and framed in black with B&W piping. 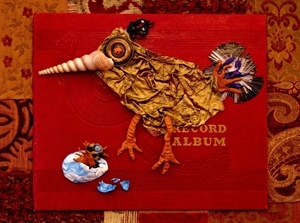 Avian mother & baby assemblage is made with vintage record album cover, fabric, shell, old broach, wire, polymer clay and more. 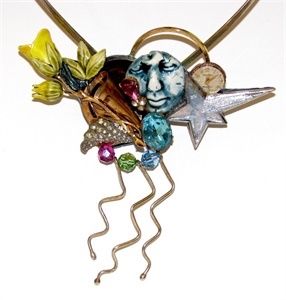 One-of-a-kind neck sculpture created from 14K gold circle, sterling silver drops, vintage broaches, porcelain, clock face, clay on a sterling silver cuff necklace. 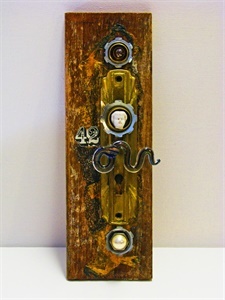 Assemblage created from plumbing components vintage door part, glass snake and vintage pottery head dug from an old factory in Germany asks the viewer to plow through the imagined fears and open a new door to the future. Content copyright by BJ Lloyd Fine Arts. Site ©2005-2013 Lucht Studios, LLC.